Music Used: Junkie XL – Unknow Song name (taken from Test Drive 5 Soundtrack). 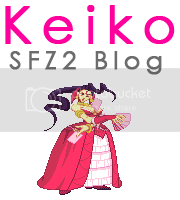 Main Concept and Idea: RSX, Gameplay performed by Keiko. What are Alpha Counter Reversals? While this is very easy to explain, it’s hard to explain how to apply them under real pressure. An “AC Reversal” is when punish your enemy’s AC attempt with any Special Move of your own when you know or guess that the AC is coming. The way to do it is to do any normal move that is cancelable (ex. Ryu’s C.Fierce, S./C. Strong) and hesitate a split second and then DP/Super/Teleport. Basically you do the motion to the point when it won’t cancel the normal unless they do the AC. C.Fierce is a good way to practice with shotos, since it’s safe when blocked and the animation is long, so the DP won’t come out by accident. So, basically, this is what would happen. We knock down Ryu (with 1 Meter) to the ground, then, we perform a Meaty C.Fierce on him expecting his AC to come. Then, we wait a split second and buffer a Fierce Shoryuken – so what happens? If Ryu does an AC from our C.Fierce, the Fierce Shoryuken stuffs his AC attempt. Another way is to do a meaty light attack and block. This will let them AC off the light attack, and then you’re free to block and actually Alpha Counter their Alpha Counter. Deep jump-ins can avoid ACs as well. With these basic examples, you can create a whole lot of different possibilities in-game to play with. Note: I made a stupid mistake in the video – I was testing some stuff with the infinite gauges cheat and I captured some AC Reversals with infinite gauges, sorry about that! But all AC Reversals shown in the video obey Gauge Limits.